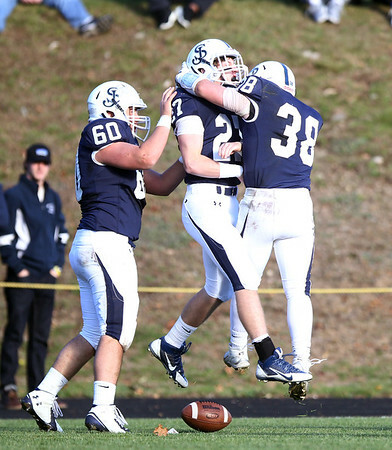 St. John's Prep junior Dillon Preston (27) leaps in the air and celebrates his touchdown with teammates Duncan Kelly (60) and Nick Spofford (38) on Saturday afternoon. The Eagles steamrolled the Raiders 42-7 in the D1 North Semifinal at Cronin Field in Danvers. DAVID LE/Staff photo. 11/2/14.